This is the first of two pieces I am writing in honor of the NOW Foundation's 15th annual Love Your Body Day taking place on Oct. 17th. If you are interested in participating in a NOW fundraiser in honor of Love Your Body Day visit About Curves and find out how you can help! Recently I purchased a box of Cheerios™. This was not typical for me. Historically I have never been a big Cheerios fan. But this was no ordinary box of Cheerios. This was New Multi Grain Peanut Butter Cheerios™ and because historically I HAVE been a big peanut butter fan, I was curious how much peanut butter taste would make its way into the cereal bowl experience. Even though my expectations were low, given past promises of S’mores, Oreo, and chocolate chip cookie cereals never quite living up to the claim that I would be eating a healthy breakfast in the guise of a guilty pleasure, I was up for the adventure with spoon in hand; albeit ready to be disappointed. So it was no surprise that as I sampled my first taste I was hit with the reality that I was eating a spoonful of mediocre cereal and not a spoonful of crunchy peanut butter. What I was not prepared for was what came next. As I sat there eating my O's and reading the back of the box (Okay, not exactly mindful eating but who DOESN'T read the box when they eat cereal?) the following words jumped out at me. I put my spoon down and shifted into my mindful reading mode and continued to examine the box more thoroughly. I felt my blood begin to boil as the wheels in my mind churned to comprehend what this box of cereal was saying to me. After decades of therapy and working on self-acceptance and developing a healthy body image I was being told that the world would be better off if there was less of me. After years of learning how to, without apology, "own my space" and use my voice sans worry of coming off too strong, too opinionated or too large of a woman, this cereal box was telling me that my life would be better if there was less of me. But what if I don’t want to be less me? What if I am fine with the me that I am? It may be un-PC of me, but dammit, I want that Cheerio dress! Wonder if they make it in my size? More relevant to the point of your post – I hate references to fatness as “unmanaged” weight, or “out-of-control”. My weight is ALWAYS out of control and unmanaged, but only a fool would assume that means it’s always rising. Totally untrue. Yes. Saw that. And that is why I have not been eating cheerios lately. We opt for a store brand that looks and tastes similar to (regular) cheerios. I look forward to reading much more of what you have to say. The comment ‘less of you’ is reminiscent for me of a comment I received as a child when I asked for some pretty clothes “you don’t want to draw attention to yourself”. Thank you! Indeed there is a great deal of work to do!! They’ve had commercials on TV for Cheerios that state eating them leads to “less you”, and those commercials are for the regular Cheerios, not the ones with the different flavors, like Honey Nut, Peanut Butter, Apple Cinnamon, or the fruit ring one that looks like Fruit Loops. I just classed them right up there with the Special K commercials, and filed them away as another commercial to be ignored, as I do most commercials. I agree Vesta, and oh if only more people had your ability to tune out these negative messages!! It is truly one of your many super powers! I have noticed that a lot of commercials talk about the ‘study’ that people who eat whole grains are slimmer. Really? How about the study that fat people dont eat as much grains because most are ‘usually dieting’ therefor not eating less of everything. I dont mean us but those who are not where we are and havent seen the light. What a crazy study. However, if ‘you say it enough it will become the truth’. ooops I ment eating less in general. Mistyped! So agree with you Marla!ghank you! What struck me most in this post was your comment, “After years of learning how to, without apology, ‘own my space’ and use my voice sans worry of coming off too strong, too opinionated or too large of a woman, this cereal box was telling me that my life would be better if there was less of me.” And that is what is most frightening. Women have extraordinary power, and as long as we are focusing that power on making sure that “there are less of us,” we will not have energy left over for fighting the things that matter – fighting for and “owning our space” and expressing strong opinions about social and economic and race/gender-based injustices. What perfect “food for thought” on NOW & “Love Your Body Day.” Now, off to make a donation! If we took all the time and energy we spent on molding ourselves to comply with unattainable standards just think of what we could do!! I’m glad that along with sending the letter, you’ve decided not to buy the product any more. The decisions to put this stuff on the package is based purely on the need to sell more cereal. If the packaging makes them sell less cereal, they will change it. Thanks for all you do! True True True!!! Thanks TFC! So very sadly true and well said. All the more reason to stand by my fave, Peanut Butter Crunch. O Cap’n, my cap’n! 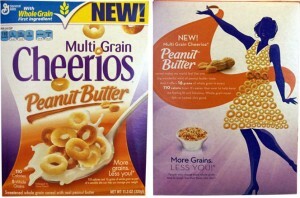 I have a problem with purchasing, eating and even caring about a product that General Mills offers. There are so many decent products with good ingredients, by smaller companies that care what their ingredients are and where their ingredients come from, that paying into GM seems a shame. Tripped across a reference to this entry from In My Skinny Genes. I’m aghast! Do none of y’all know about anti-nutrients and phytates in grain — and how damaging grains are to the human body? Not just to celiacs, but to humans generally? The whole idea of: “This box of Cheerios is okay, this one isn’t” is SO wrong! PLEASE keep researching and find abetter (healthier!) way to eat! ANY kind Cheerios is an unhealthy thing! Elenor, I am glad you found my blog and that you agree with my disagreement about the Cheerios Fiasco! I am not a registered dietician or certified nutritionist so I cannot really comment on your statement about grains from a place of statistical evidence, but I do appreciate your writing and hope you find yourself reading my blog posts in the future!